The Johnstown Tomahawks are back home and ready to begin their longest homestand of the 2013-2014 season. The next 11 games on the schedule all take place at the Cambria County War Memorial Arena. Make sure if you only get to a few games this season, it's during this long homestand because once it's over the Tomahawks will only be at home twice in December and twice in January. This week Johnstown battles the Soo Eagles. Soo currently has a record of 5-5-3 which isn't bad but it is a record that the Eagles aren't use to. Last season the Eagles finished first in the division with a record of 41-14-5. Like the Tomahawks, Soo has seen a lot of new faces in their lineup and currently are trying to figure out their team identity. Johnstown and Soo played either other earlier this season. Below are the results and the boxscores. Johnstown comes into the game with an overall record of 7-5-1 on the season. This will be the first time Colin Brennan will be back at the War Memorial since he was released by the team during training camp. Johnstown is 3-2-1 at home this season (2-2 at War Memorial, others games where at NAHL Showcase). Soo is 0-3-1 away this season. Signed Garrison Sanipass. We broke that signing on our blog a couple days ago, the post is called Tomahawks Add Huge Forward. Trivia: Sanipass's father is a former NHL player who played in a total of 164 regular season games with Chicago, and Quebec. He was also drafted in the first round (14th overall) by the Chicago Blackhawks in the 1986 Entry Draft. A little over a week ago we looked at the Tomahawks attendance for their home games this season. We didn't use the numbers from the Showcase, only games that were played in Johnstown. Last season after four games at home Johnstown had an average attendance of 2,078. This year after four home games, Johnstown has an average attendance of 2,098. This weekend is Johnstown's Faceoff Against Cancer weekend. The ice will be pink, the team will be wearing special jerseys, and they'll be teaming up with Conemaugh Health Foundation to raise awareness and support for cancer research. One player, Eric Tien has been sharing his story this past week about his own fight against cancer. Here are some links to his story via Johnstown news outlets. Definitely worth checking out. 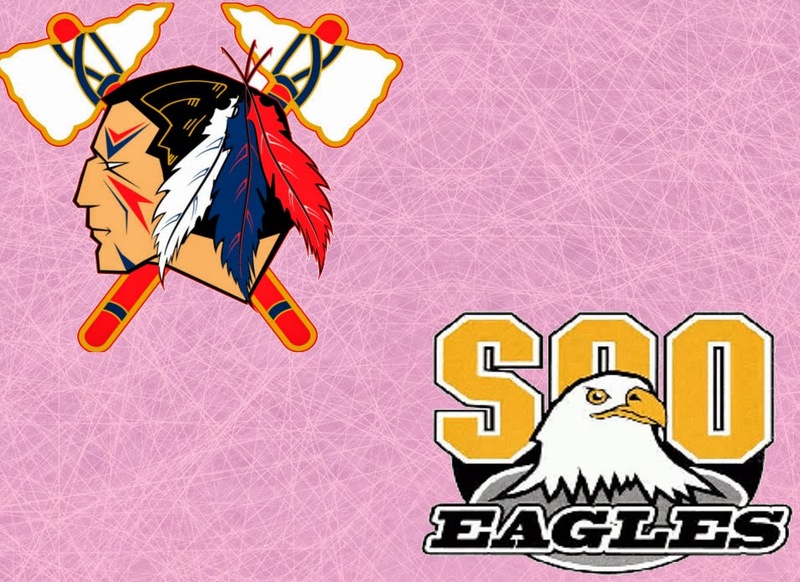 The Soo Eagles are already on their bus headed to Johnstown, PA to take on the Tomahawks this weekend. The trip to Johnstown is easily the longest time the boys will spend on the bus. Following the twelve-ish hour bus ride are three tough games. The Tomahawks are third in the division with a 7-5-1 record while the Eagles are in fifth place in the division with a 5-5-3 record. In their last meetings, the Eagles were only able to take 3 out of a possible 6 points. The boys are coming off a weekend sweep against Wenatchee and look to pick up all 6 points this time around and hopefully move up in the standings. The Soo Eagles have captains and alternates, finally. This season’s captain is #10, Ryan Urso. Urso, a 1993 birth year from Livonia, MI is in his last season of juniors. Before the 5’10” forward came to the Eagles he spent two seasons playing in the NAHL with the Jamestown Ironmen recording an impressive 34 points and 152 PIMs. After the Ironmen folded, he made the transition to the Eagles. Currently, he is tied with AJ Jarosz for the most points (10) and he leads the team in PIMs (30). Many people will tell you that he is the nicest kid off the ice, but it is best not to cross his path on the ice. This season’s alternates are Denver Pierce, AJ Jarosz, and Bradley Mueller. Jarosz and Mueller will be alternating wearing the ‘A’ for home and away games, respectively. Denver Pierce is a Soo native, 1995 birth year, forward. He made his junior debut with the Eagles last season putting up 12 points and 20 PIMs. Prior to juniors his was part of the Soo Indians Major Midgets for two seasons. According to the NAHL website he also has a commitment to play at Northern Michigan University (NCAA I). AJ Jarosz is a 1993 birth year who hails from Crystal Lake, IL. Prior to joining the Eagles he played two seasons with the Corpus Christi IceRays putting up 70 points and 57 PIMs. Bradley Mueller is also a 1993 birth year, but his history is a bit different. The 6’1 defensemen from Oak Park, IL committed to play with St. Olaf College (NCAA III) last season and decided to play out his last year of junior eligibility with the Soo Eagles. He was part of the Chicago Young Americans U18 & U16 prior to his NCAA commitment. Like most teams in the NAHL, the Soo Eagles take full advantage of the open add, drop and trade practice until the February deadline. The protected list is outdated (10/18) and the only transactions made are Michele Marchetti (F) traded to Brookings and Josh Ward (F) released. In addition, the Eagles have shifted their online roster a bit, adding Jeremy Norway (1995, F) who in his first game with the Eagles picked up his first goal. Also, Jimmy Slivka has been switched from an Inactive Players list to an Active Player. Instead of releasing Charlie Hemstrom (D) the Eagles have listed him as Inactive along with Matt Menta (F) who is still recovering from an injury. My inside knowledge can tell you this, forwards Patrick Thompson and Anthony Saleh have left the team and went home and defensemen Charlie Hemstrom did not have plans to return to the NAHL when he left either. In addition, Michael Caruso is nursing a shoulder injury but has not been placed on an injured reserve list so when he will play has yet to be determined. It might be this weekend or it might not be. One thing is for sure, fans cannot depend on the protected list or the roster/statistics pages online. Saleh was removed from the USA Hockey Protected List (NAHL Roster and USAH lists don't match). Caruso was deleted from the USAH list last week for "strategic" reasons (i.e. to make a hole). Ward was finally deleted yesterday, perhaps to make room for Caruso. Hemstrom was assigned a bogus injury date of 10/17 (he left the team on 10/13) and his rights are being held "hostage".